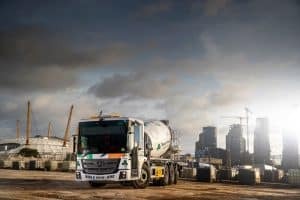 My name is John Moriarty and I am Transport Manager of Moriarty Haulage Ltd. We are based in London and run a fleet of concrete mixers transporting wet concrete for concrete companies such as Cemex and Hanson to name a few. Over the last year of maintaining Gold status we have overseen a large fleet replacement with new Low Entry Mercedes Econic mixers which has helped reduce are incident rate dramatically. FORS was introduced to us as an industry requirement, however we could see the long term benefit of using best practice to be able to demonstrate we are a reputable haulage business. Since our first audit we have progressed to Gold and maintained this by year on year investment in the latest technology and current initiatives. Over the last year we looked at where we could try to make improvements in line with our FORS requirements. This took us to a discussion with our preferred Mixer body builder where we tasked them to come up with a “Low Noise” mixer. After some discussions and bouncing of ideas, we are happy to say we have a prototype running in our fleet delivered as part of our large fleet replacement. FORS best practice along with London requirements has seen our truck specification change dramatically for the better. Driver are able to drive with confidence with the latest technology to aid them conduct their daily duties in a safe manner. Access to training from FORS continues to keep safety and best practice at the forefront. Over the years we have seen site requirements progress from Bronze to Silver and Gold. We could see this being the case and wanted to be ahead of the curve and demonstrate that we were a forward thinking company. If we was going to do this then we wanted to do it well. Performance data – This last year we have seen a big improvement in incidents and PCN’s. We credit the reduction in incidents to our new fleet or Low Entry Mercedes Econics. Driver health and fitness review – We currently get our drivers to complete health questionnaires every 6 months and encourage our drivers to declare any medical issues for which we would try to assist where possible. We also promote various healthy living initiatives. Strategy for recruiting drivers – We actively recruit new drivers through recommendations from our existing pool of drivers or by people making contact with us through the office. Our vehicles are quite specialised so we cannot just put any driver into a seat, they need to be trained and we are more than happy to do this for a minimum of a week. A new driver would firstly shadow one of our lead drivers before then taking over driving duties where they are then assessed. At the end of the training period we would speak with our lead driver and assess whether we feel they are competent to drive or require additional training which we would then feedback to the new driver. New drivers would also need to book themselves onto an MPQC EPIC Driver Skills Card course which is mandatory for our industry. Noise assessment – We tasked our supply chain to produce a “Low Noise” mixer and we now have a prototype running which is being monitored. 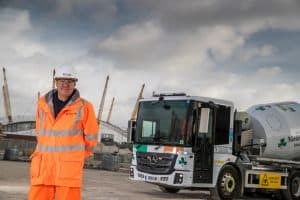 Modal shift and alternative vehicles – Delivering concrete, our deliveries are time critical and rely on the road network so we are restricted in terms of modal shift. Also due to the nature of our vehicles requiring the drum constantly turning we are restricted with regards alternative vehicles. We have taken delivery of a large number of Euro VI vehicles with Low Entry cab. Also when attending meetings in London where possible we would look to use Public Transport. Our future plans are to continue to strive to make trucks in our industry safer and work better for our drivers. We will continue to monitor alternative fuels with the hope of one day having an electric mixer. With FORS we continue to see improvements, a trend we want to maintain.